As soon as we get a taste of some sunshine, the question is always the same. Will it last? Or have we had our fill for the summer? It certainly may feel like we are heading towards the end of our hot weather quota - but, according to the Met Office, we still have some left to enjoy! 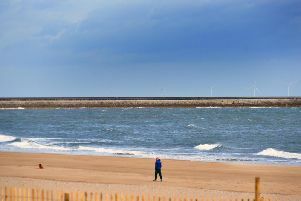 Forecasters are predicting a warm and sunny weekend for families in South Shields, so it sounds like the perfect time to grab your sunglasses and head to the beach for a day out. We’ve got a canny few days on the horizon as we head into the weekend, but Sunday will be the day to enjoy the great outdoors with clear skies and temperatures of 17°C. Saturday afternoon will be sunny too if you want to choose a few hours to sunbathe, and the hot weather is set to continue into next week. Swans at Hebburn Nature Reserve enjoying the sunshine. The Met Office is currently predicting highs of 17°C as we head towards Wednesday. Best check your office fan is in full working order! Heat wave temperatures at Sandhaven Beach. Leighton, 9 with brother Lennox Bell, 4 from Washington.